The distinctive flavors of lemonade and cherry combine to make this super-delicious Super-Sour Cherry KOOL-AID. Place drink mixes and sugar in large plastic or glass pitcher. Add water; stir until drink mixes are completely dissolved. Serve in 8 tall glasses over ice cubes or crushed ice. Prepare as directed, substituting 1 qt. (4 cups) each cold pineapple juice and ginger ale for the 2 qt. cold water. Prepare any flavor KOOL-AID Sugar-Sweetened Drink Mix or KOOL-AID Unsweetened Drink Mix as directed on package. Pour into plastic ice cube trays. Freeze until firm. Use instead of plain ice cubes to chill cold drinks without diluting the flavor. 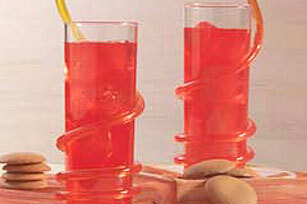 Substitute any flavor KOOL-AID Unsweetened Drink Mix for the cherry flavor drink mix.